Once again, I headed south on High Ridge under the Merritt, and once again, the pink car took my breath away. 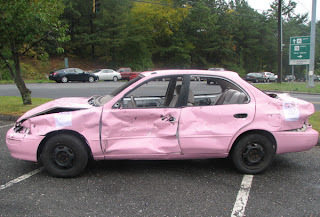 Last Saturday I paid ten dollars to support breast cancer, and I got to smash the car with a sledgehammer. I wondered all week what the car ended up looking like by 5pm, and I kept meaning to call raveis to find out. Well, the pink car explained itself.